This dissertation focuses on the sub-national impact of foreign aid on civil conflicts by asking the question: How does foreign aid committed to contested areas affect the intensity of violence in those areas? 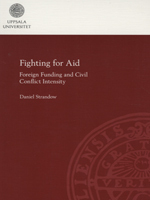 The main theoretical contribution is to focus on how aid influences warring parties’ decisions to engage in contests over territorial control and how that in turn influences violence intensity. The study introduces two concepts: funding concentration and barriers to exploiting aid. A contested area has greater concentration of funding if warring parties expect a high value of aid to be distributed to only a few locations. Funding is instead diffused if the parties expect aid to be spread over many locations. A low barrier to exploiting aid is present if it is of a type that both state and non-state actors could potentially misuse. There is a high barrier if territorial control is required in order to exploit funding channels. The theory introduces three testable implications: First, greater funding concentration encourages conventional contests over territorial control, which increases military fatalities. The second proposal is that if there is a low barrier to exploiting aid (e.g. humanitarian and food aid) then there will be increased competition between warring parties and civilians, and hence more civilian fatalities. Third, high barrier funding (e.g. education aid) will motivate contests over territorial control and increase military fatalities. This dissertation uses geo-coded aid commitments data and introduces data of warring parties’ battleground control in sub-Saharan Africa, 1989–2008. The research design relies on propensity score matching where pairs of observations are matched based on a range of covariates. The results concerning barriers to exploitation are partially supported. High barrier aid increases military fatalities whereas low barrier aid has little impact on violence. Greater funding concentration increases military fatalities substantially compared to if there is low or no funding concentration. In line with theory, greater funding concentration does not increase civilian fatalities.